The catalogue is frequently updated with new datasets. Here are the latest datasets added, and one coming soon (Sargassum observations). 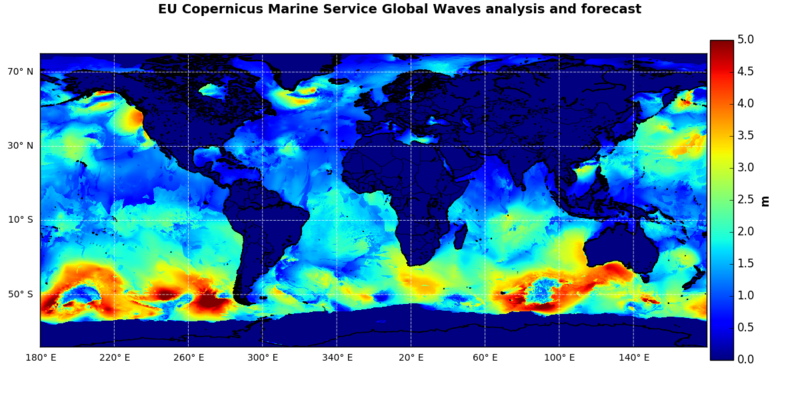 The operational global ocean analysis and forecast system of Météo-France with a resolution of 1/5 degree is providing daily analysis and 5 days forecasts for the global ocean sea surface waves. This product includes 3-hourly instantaneous fields of integrated wave parameters, as well as the following partitions: the wind wave, the primary and secondary swell waves. More details here. 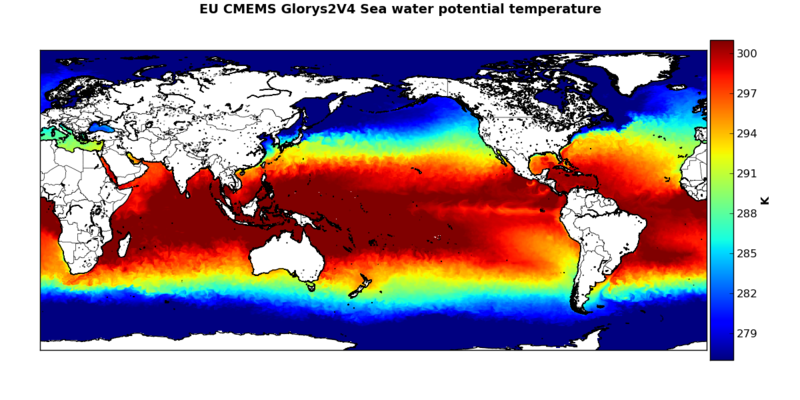 The Mercator Ocean GLORYS2V4 global ocean reanalysis for the Global Ocean and Sea Ice Physics : daily means of Temperature, Salinity, Currents, Sea Surface Height and Sea Ice Parameters, at 1/4 degree horizontal resolution, with 75 vertical levels, forced by ERA-Interim atmospheric variables and covering the 1993-2015 time period, with SEEK/IAU Data Assimilation of Temperature and Salinity profiles as well as Sea Level Anomalies, Sea Ice Concentration, Sea Surface Temperature and mixed layer depth. This map shows over the Atlantic a large cluster of floating vegetation assumed to be Sargassum, as captured by MODIS/Aqua on December 06th, 2017. Pixel resolution is 250 m. Deep blue is for clear sky ocean, white is for clouds, and the color scale from light blue to red is for the Normalized Floating Vegetation Index (NFAI). The highest values of NFAI correspond to pixels completely filled-in by vegetation, and/or emerged and healthy vegetation. On the right is shown a plot of the Rayleigh corrected reflectance spectrum associated to the pixel of the map indicated by the red arrow. This spectrum is characterized by a strong increase in the near infra-red, which is the signature of vegetation.